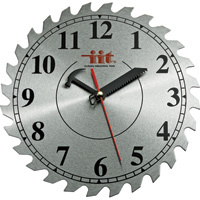 Complete the work theme in your shop, garage, or basement with this 10” Saw Blade Shop Clock! Features a 10” 28-tooth blade with a jigsaw blade for the minute hand, the black metal outline of a hammer for an hour hand, and standard red metal second hand. Accurate quartz movement runs on one AA battery (not included). Makes a great gift for the woodworker in your life. This entry was posted in New Products and tagged 10'' Saw Blade Shop Clock by bdks. Bookmark the permalink.